Receiving a diagnosis of cancer has a huge impact on most people. Feelings of depression, anxiety, and fear are very common and are normal responses to this life-changing and potentially life-ending experience. But cancer diagnosis is not necessarily a death sentence. Over half of the people diagnosed with cancer are still alive 10 years later and this number is rapidly increasing. But, surviving cancer carries with it a number of problems. Fatigue and insomnia are common symptoms in the aftermath of surviving breast cancer. Mindfulness training has been shown to help with cancer recovery and help to alleviate many of the residual physical and psychological symptoms, including fatigue, stress, sleep disturbance, and anxiety and depression. One particularly effective mindfulness training program is Mindfulness-Based Stress Reduction (MBSR). The MBSR program consists of 8 weekly 2-hour group sessions involving meditation, yoga, body scan, and discussion. The patients are also encouraged to perform daily practice for 15-45 minutes. The research has been accumulating. It is thus important to take a step back and summarize what has been learned. In today’s Research News article “Mindfulness-Based Stress Reduction on breast cancer symptoms: systematic review and meta-analysis.” (See summary below or view the full text of the study at: https://www.ncbi.nlm.nih.gov/pmc/articles/PMC6282865/ ), Castanhel and Liberali review, summarize and perform a meta-analysis of the published research studies on the effectiveness of Mindfulness-Based Stress Reduction (MBSR) training for the symptoms of breast cancer patients. They identified 7 published research studies that included a total of 532 women. They report that the literature finds that Mindfulness-Based Stress Reduction (MBSR) training produces a decrease in fatigue in the breast cancer patients. This is significant as fatigue affects all facet of the patient’s life. Additionally, there is no drug treatments which successfully treat fatigue in these patients. This makes MBSR treatment particularly valuable to be included along with the usual treatments. Mindfulness practices, in general have been shown to be effective in relieving fatigue. One of the components of MBSR treatment, yoga practice, has been previously been shown to also relieve fatigue in breast cancer patients. It is possible that this is the critical component of MBSR practice. But it will require further research to determine exactly which components or combinations of components are essential for the relief of fatigue. So, improve breast cancer symptoms with mindfulness. 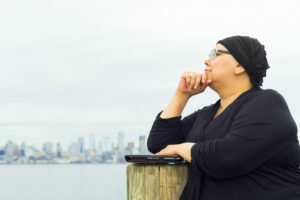 Mindfulness-Based Stress Reduction practices increase the capacity for concentration and attention, and these practices are particularly effective for people with breast cancer. To analyze the effects of the application of Mindfulness-Based Stress Reduction on breast cancer symptoms. Systematic review and meta-analysis were carried out. To find suitable studies, the PubMed/ MEDLINE database was searched using the keywords “breast cancer” and “Mindfulness-Based Stress Reduction”. Studies included were published between 2013 and 2017, written in English and showed methodological quality through the PEDro scale (score greater than 3). They also presented empirical evidence, had an experimental study design (randomized or non-randomized), and had full text available. For the meta-analysis, we used a random-effects model, with standardized mean differences and 95% confidence intervals. Seven studies were included, one non-randomized and containing only an intervention group of Mindfulness-Based Stress Reduction, and six randomized including samples of two or three groups. The non-randomized study showed 6 points on the PEDro scale, the randomized studies of two groups 6 to 7 points and studies with three groups showed 7 points. In the meta-analysis of the two randomized studies, the results, although not significant, revealed a moderate effect for Mindfulness-Based Stress Reduction on the outcome of fatigue, with a mean difference of −0.42 (95%CI −0.92- −0.07; p=0.09). Mindfulness-Based Stress Reduction seems to be a promising alternative for treatment of this disease’s symptoms.